Trading sugar, anyone who has been reading this blog lately knows that I've been looking for an entry into that market for a while. Yesterday I entered into the October contract mid-morning quite impulsively. I was "chasing prices" as they had posted a bit of a drive up above the moving average after having displayed a pretty decent MACD divergence bottom late last week. I bought too high and was punished, rightly so, by taking a 0.02 loss at the end of the day trading sugar. However, I was not quite satisfied, as I was still of bullish intent. 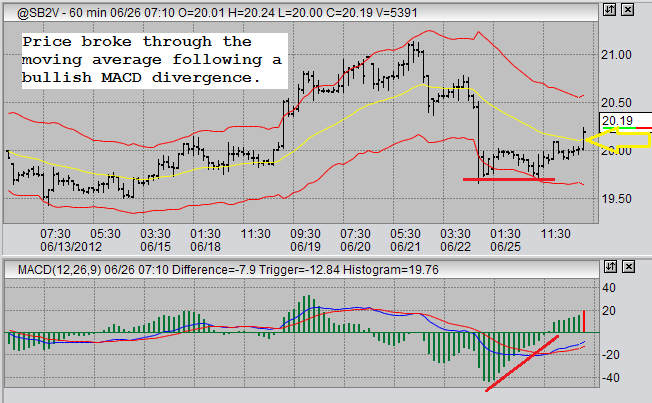 I was able to enter a couple of ticks below the moving average on a second entry very early Wednesday morning. It seems to have paid off, so far. Again, for anyone who has been reading this blog, you know that I'm looking for an extended upward dynamic in sugar prices and sugar trading as opposed to a short half-day trade. First, let us look at the sugar trading chart for my first entry. 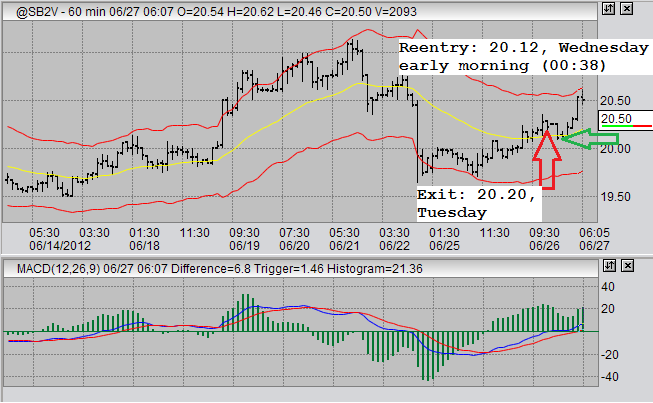 Entry was a buy and occurred at 7:06 on June 26 at a price of 20.22. This is a price chart for the October sugar contract in the 60 minute trading time frame. We can see by the red lines on the price and the MACD that we are observing an MACD divergence indicating a price bottom in the 60 minute time frame. I was originally waiting for a third touch down to the 19.70 level, but after breaking through the moving average Tuesday morning I realized that was not going to occur while maintaining "bottom" status. That's why I moved impulsively to enter too high. What I should have done was wait until a retracement to the moving average, which did in fact occur almost immediately after my entry. In a fast moving market my entry could have worked out, but sugar was moving slowly that day and it did not work out for me. I was left unsatisfied with my position and I decided to exit at the day's close. Upon my exit I already knew that I would be looking for a new entry along the moving average. Let us now look at the futures trading chart for October sugar on the morning of Wednesday, June 27, my second entry trading sugar. I had calculated where I wanted to enter and set an alert to awaken me if the price reached that level during the night. As it happened, price reached my buy zone eight minutes after the market opens at 00:30 local time. My second entry trading sugar occurred at 00:30 on June 27 at a price of 20.12. The moving average at the time was at 20.14. I set my stop and an alert and went back to bed. This is what I awoke to. The most important thing to note in this chart is that MACD histogram is at almost equal levels with its highs from yesterday, and the MACD moving averages continue upwards. This tells me not to take profits just yet. I did, of course, raise my stop into the automatic profit zone, but it is substantially looser than I would normally have it. I do not want to get stopped out prematurely, as I am expecting more gains on this trade. I will look for an exit when the MACD histogram or moving averages start diverging with new price highs.